The lament of the modern beer nerd: There are way too many new and exciting breweries popping up all over the country. I know, it's a good problem to have, and I only have one liver, so it'd probably not be wise to sample every brewery, even if I could easily acquire them all. But I'm not blind, and I do find myself intrigued by a lot of breweries that I'll probably never sample. And that's ok, but I certainly won't turn down the opportunity, should it present itself. Enter San Diego's Modern Times. I first heard about them from Michael Tonsmeire (aka The Mad Fermentationist), a prolific homebrewer of some repute who was hired by Modern Times as a "Consultant". From reading Tonsmeire's blog, I'll wager that this was a pretty safe move on Modern Times' part. Then the brewery opened last year, and The Beer Rover gave it solid marks. And finally, a can of Fortunate Islands, a hoppy American wheat ale (made with Citra and Amarillo hops), shows up at my doorstep. What's a guy to do? Beer Nerd Details: 5% ABV canned (16 ounce pounder). Drank out of a Willibecher glass on 10/3/14. A good first impression, and when I look at their website, they have links to their recipes too. And not those lame recipes that don't specify the proportions, they have the full recipes. On the can, they even say "You should totally tinker with the recipe for this beer. It's on our website." This is most endearing. 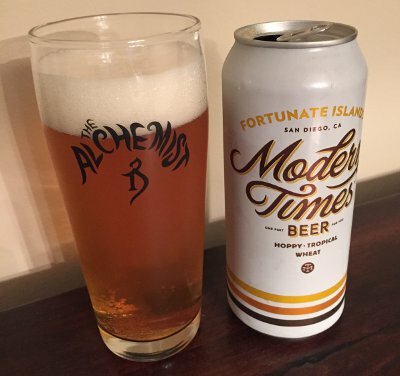 I shall endeavor to secure more Modern Times beers. Now if you'll excuse me, I have to get this David Bowie "Modern Love" song out of my head. This page contains a single entry by Mark published on October 6, 2014 10:56 PM. Avery 5 Monks was the previous entry in this blog. Schlafly Pumpkin Ale is the next entry in this blog.